The water swirling through the ancient structure and the darkness of the ruined depths hide a multitude of secrets within this forgotten Nedic temple. Reinhold's Retreat is a hidden Nedic ruin located beneath Belkarth. 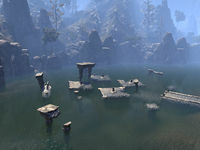 The ruin can only be accessed by activating the sconces in the lake south of Belkarth, and only during the related quest. The Missing Guardian: Rescue the Thief from the Serpent's corruption. Madleena Blackvein is found here with two Lamia Curares. The first room consists of a small pool with various pillars surrounding it. The staircase west of it leads towards a cave with Scaled Court Archers and Illusionists, with the door past it going to the Sanctuary. 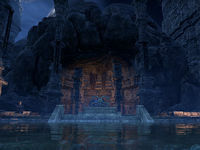 Prior to the One Tamriel update, a group of four was required to initially open this dungeon, although it could then be entered and completed with less. Belkarth Outlaws Refuge is also located within a Nedic ruin, suggesting a connection with this ancient city. This possible connection was discussed by Lady Laurent in a Loremaster's Archive Q&A. This page was last modified on 19 November 2018, at 06:45.